Makeup artists know the value of having a makeup setting or sealing product as a staple item in their kit. These are film forming sprays that help provide more durability in a makeup application that needs to be stable and long wearing. They also provide greater makeup protection under moisture conditions. Sealers also allow you to layer makeup products over one another without smearing or absorbing the color underneath, and helps keep colors true to wear. They provide a measure of protection in keeping makeup from rubbing or transferring onto clothing. Makeup sealant sprays come in three basic formulas: water/acrylic based, alcohol/water/acrylic based, and alcohol/water based. Understanding the performance differences with these ingredient combinations, and what they can provide, is the key to getting satisfactory results from the sealer application. Some sealers are more moisture and rub proof than others, and it depends entirely on the percentage of alcohol or acrylic that is blended in the formulation. The successful wear of your sealer depends on choosing the right one for the job at hand. It is also important to know what kind of texture (finish) each sealer will leave behind on the makeup application. Water/acrylic sealers provide a protective film on makeup that is touch proof, but not entirely rub proof. They also provide moisture resistance, so the makeup won’t streak under perspiration and oil, and is easily blotted off. They are a better choice for sensitive skin than alcohol based sealers, which can make skin look a little too dry. However, these kinds of sealers do get absorbed by the makeup during the course of wear, so you may need to repeat the application. This is especially true with oily type skin. Keep in mind that some acrylic/water based sealers might leave a semi-matte texture on the makeup, depending on the type of makeup you want to seal, and if it is powdered before you apply the sealer. Stay tuned for part 2 for this discussion on sealers and their use. I am very interested in knowing more about these sealers. I’m 55 going thru that time when we women sweat. In addition I had breast cancer and the medicines I’m on makes me sweat so bad I drip. I’m using She Laq on my eyebrows, fantastic stuff there, but I don’t use it as and overall setting spray. I prefer a matte finish and noticed that in your article you stated an acrylic/water base does that. So can you make any recommendations as to a product that carries acrylic/wate base? 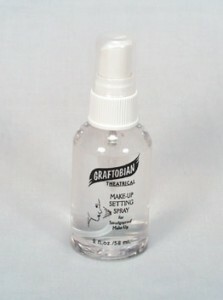 I like using Graftobian’s Setting Spray, and Premiere Product’s Hi-Def Matting Spray, both of which can be found on this page: Hi-Def Matting Spray will provide a little less “texture” on the skin, but I like both. Hope this helps and wishing you all the best!